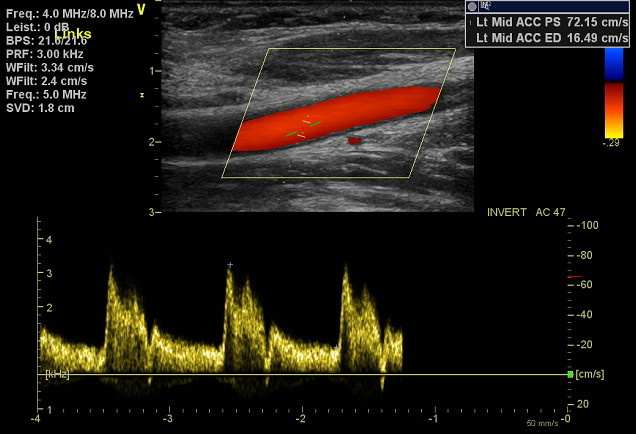 Here you can find out which ultrasound techniques are available in our practice for diagnosis of the heart and carotid arteries. Echocardiography (an ultrasound examination of the heart) is a key component of cardiological diagnosis. This method enables many diseases of the heart to be detected or excluded as possibilities. Echocardiography provides a detailed insight into how the beating heart is currently functioning without the use of x-rays. A duplex scan of the carotid arteries enables the route and nature of the carotid arteries to be assessed. For instance, early changes caused by arteriosclerosis, constrictions or vascular occlusions can be shown, and check-ups can be performed post-operation following vascular surgery and interventional procedures (e.g. stent implantation). To enable the performance of state-of-the-art echocardiographic procedures, modern high-end ultrasound systems (GE Vivid E9 and E95) are available. 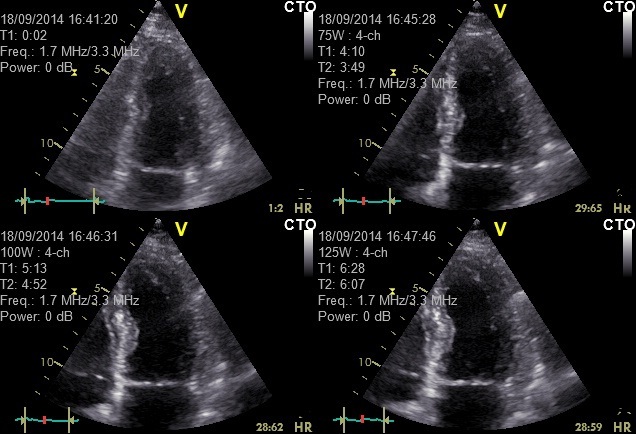 Transthoracic 2D echocardiography (2D-TTE) is the most commonly used echocardiographic method. The representation of the heart’s structures and the function of the myocardium and cardiac valves enables, for instance, myocardial insufficiency or a previous heart attack to be identified. Defects of the heart valves (e.g. narrowing or “stenosis”, or leaks [“insufficiency”]) can be detected. Heart defects (e.g. “atrial or ventricular septum defects”), accumulations of fluid in the pericardium (“pericardial effusion”) or an expansion of the aorta just after the exit from the heart (“aortic aneurysm”) can also be diagnosed. Post-operative care following surgery on heart valves (e.g. reconstruction or valve replacement) or after heart valve catheterisation (e.g. “MitraClip” or “TAVI”) is also possible. 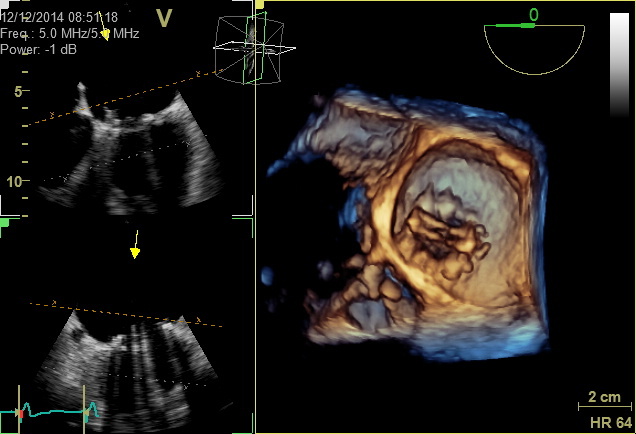 Three-dimensional transthoracic echocardiography (3D-TTE) provides additional information to complement two dimensional transthoracic echocardiography (2D-TTE) when certain questions arise. 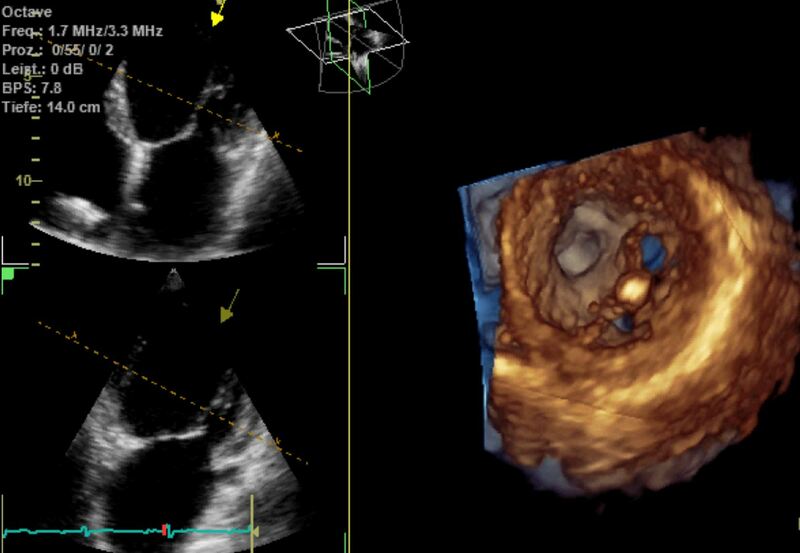 Three-dimensional transthoracic echocardiography is used to generate a full record of the volume of the entire heart, which allows for a spatial view of various structures of the heart. For instance, this enables the heart’s valves to be displayed in a spatial context as a heart surgeon would see them during an operation on the valves. 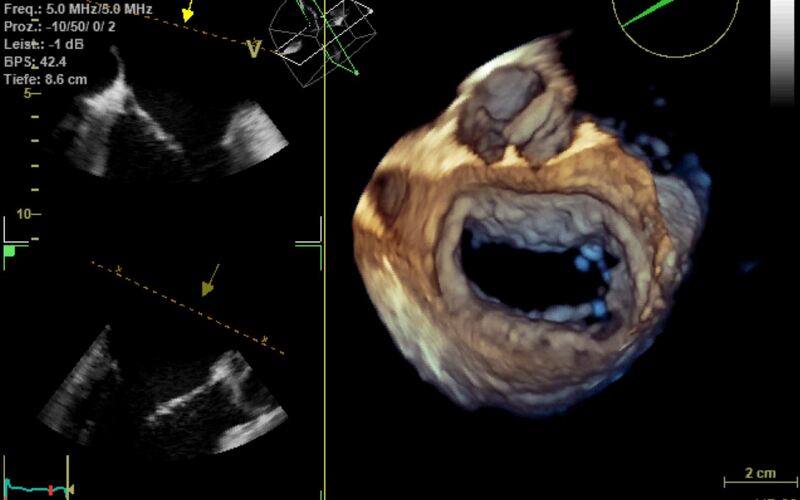 After a MitraClip implantation, the orientation and position of the clip on the mitral valve can be clearly shown. It also facilitates measurements on the aorta, because precise alignment with the structures to be measured is possible. It is also possible to gather information about the myocardial mass, for instance where the myocardium is thickened due to high blood pressure. Transesophageal echocardiography involves the heart being sonographically probed from the oesophagus and the stomach. A number of the heart’s structures can be represented from here that are not adequately visible to transthoracic echocardiography from the outside. The probe’s higher ultrasound frequency and the direct position behind the heart – without being obscured by air in the lung – enables better representation of the details of individual parts of the heart (e.g. the mitral valve or the left atrial LAA appendage). We perform multiplanar, transesophageal echocardiography in our practice using a probe that can emit sound waves to the heart from different directions. 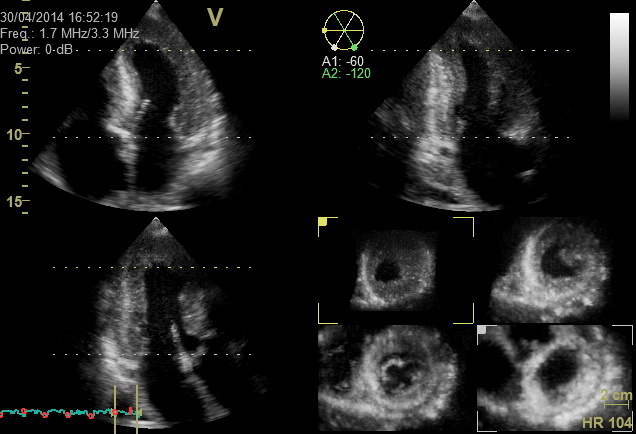 Special preparation is necessary for transesophageal echocardiography. Because a probe is fed into the oesophagus and stomach, information and a written statement of consent (at least 24 hours before the examination) are required. For the examination, patients must be nil-by-mouth for four hours before the examination (no food, no drinking, no smoking). The examination is performed under superficial pharyngeal anaesthesia, and can also be performed under sedation or sleep-inducing drugs (no anaesthetic) if necessary. The examination lasts around 10–20 minutes. Afterwards, the patient must remain nil by mouth for another 1–2 hours due to the pharyngeal anaesthesia. If sedatives are used, the patient must be accompanied home after waiting for a suitable amount of time in the practice. In this case, for the day of the examination, the patient is not deemed fit to conduct business or to drive a car. Contrast dyes that only generate a contrast on the right side of the heart are used in transesophageal echocardiography in particular to diagnose shunts in the heart (“short circuits”), where blood is leaking from the right to the left side of the heart. An example of a typical problem is the exclusion of a patent foramen ovale (a small hole in the atrial septum) when searching for causes of a stroke. Because there is currently no commercially available ultrasound contrast dye for the right side of the heart, Gelafundin® is used to provide contrast. 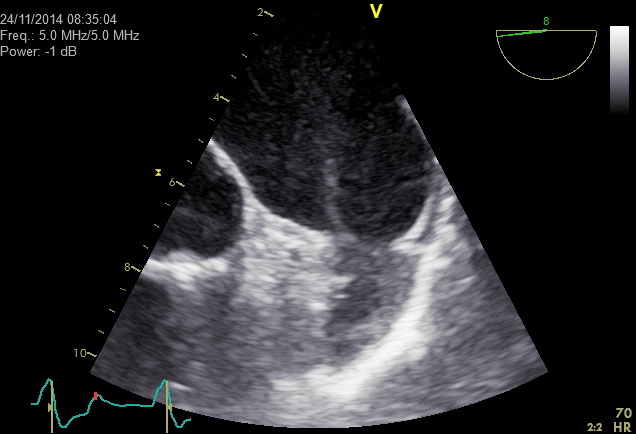 With two-dimensional transesophageal echocardiography (2D-TOE), cross-sectional images of the heart are generated in the same way as two-dimensional transthoracic echocardiography, with the Doppler techniques listed above being used in particular for further analysis of the heart’s functions. 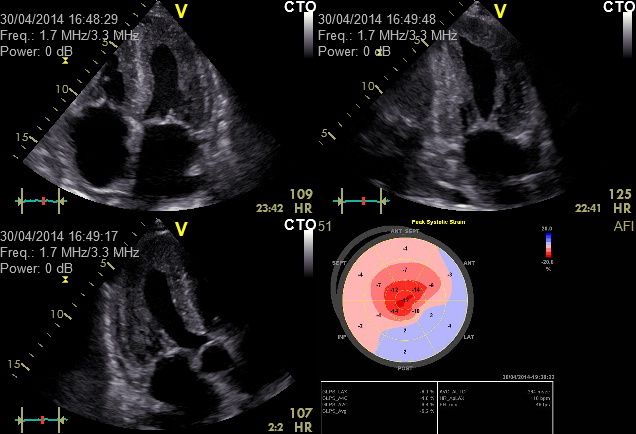 Three-dimensional multiplanar transesophageal echocardiography (3D-TOE) enables data to be recorded on the volume of the overall heart. This data can be used to generate a realistic spatial representation of the heart’s structures, which in turn allows for particularly accurate planning of special heart catheter procedures (e.g. occlusion of the left atrial appendage, MitraClip implantation) as well as optimum preparation for heart surgery. 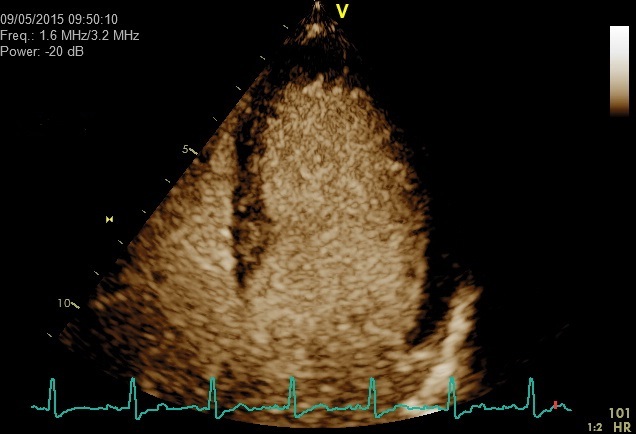 Common reasons for the use of transesophageal echocardiography include the exclusion of blood clots (thrombosis) in the left atrium and the appendage prior to cardioversion or when searching for the sources of embolisms from the heart after a stroke. 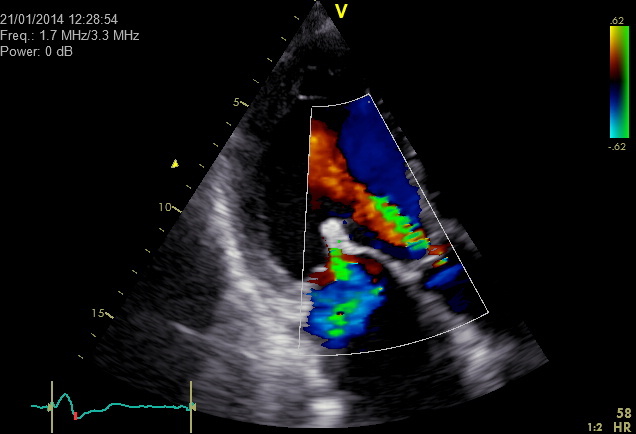 Transesophageal echocardiography is an indispensable tool nowadays for diagnosing bacterial inflammation (endocarditis) of the heart’s natural or prosthetic valves, performing an assessment of the severity of a possible aortic valve stenosis (narrowing of the aortic valve), and for generating precise representations of pathological changes to heart valves (e.g. heart string tears on the mitral valve). In stress echocardiography, a transthoracic echocardiogram is taken under rest and stress conditions (on the ergometer bicycle or pharmacologically using dobutamine). 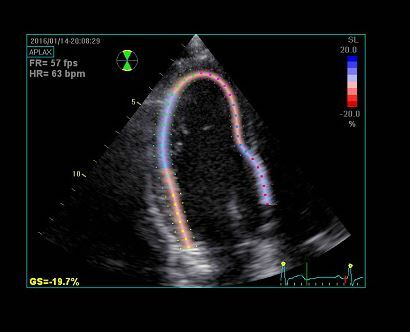 Stress echocardiography is used in more extensive diagnosis of coronary heart disease (e.g. suspected perfusion problems of the heart, check-ups of stent implants or bypass operations, checks for heart attacks). Ergometric stress echocardiography is similar to a stress ECG. While the ECG is being registered, an increasing stress is applied for around 10 minutes in semi-supine, sometimes slightly reclined position. Unlike the stress ECG, however, additional echocardiographic image loops are generated under rest and stress conditions and are digitally stored in stress echocardiography. These image loops are compared after the examination. Impaired perfusion of the heart is typically indicated with increased stress in the form of an impaired pumping function (regional wall motion abnormalities) of the heart in the area with less circulation. If stress conditions cannot be established on the ergometer bicycle due to orthopaedic problems, for instance, an examination based on a pharmacological solution can be performed without physical stress. Because this involves the infusion of a drug (dobutamine), information and a written statement of consent (at least 24 hours before the examination) are required. In our practice, this procedure is performed by administering a dobutamine infusion of increasing dosage (sometimes combined with atropine) for around 10 minutes to stimulate the heart in the same way that physical stress would. For the examination, the patient should be nil-by-mouth for around two hours (no food, drinking or smoking). After the examination, it usually only take a few minutes for the effects of the medication to wear off. 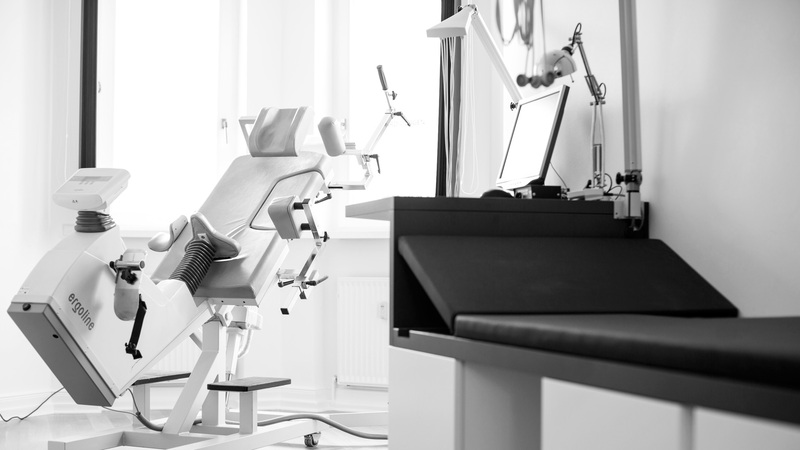 The patients remain in our practice for at least 30 minutes after the examination. If atropine has been administered, the patient must not drive a car for several hours, as their sight may be temporarily impaired. The doctor should be consulted regarding suspending medication (in particular beta-blockers such as metoprolol, bisoprolol, nebivolol, atenolol, propanolol and carvedilol) before an ergometric or pharmacological stress echocardiogram. 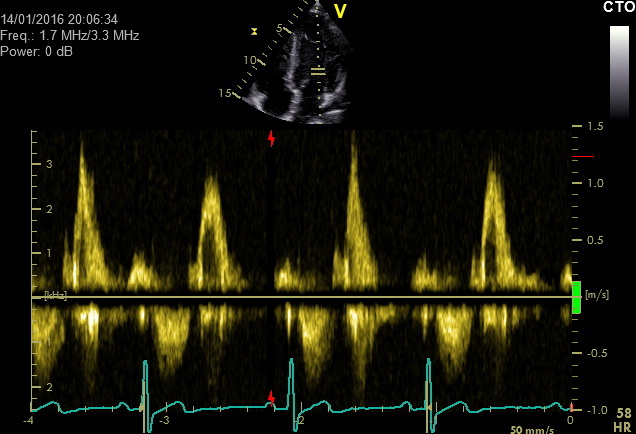 Another indication for the performance of a stress echocardiogram may be the ongoing assessment of heart valves, of specific myocardial disorders (e.g. HOCM) or of the global pumping function of the left heart while under stress. 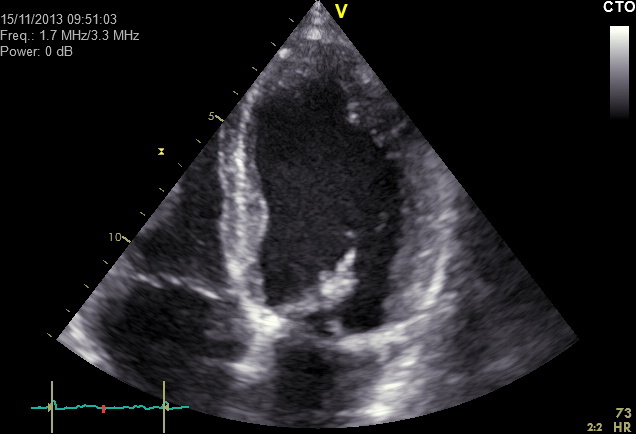 If the quality of the information provided by the ultrasound images is limited, stress echocardiography can also be used to improve diagnostic accuracy, possibly by introducing a contrast dye for the left heart (see below). 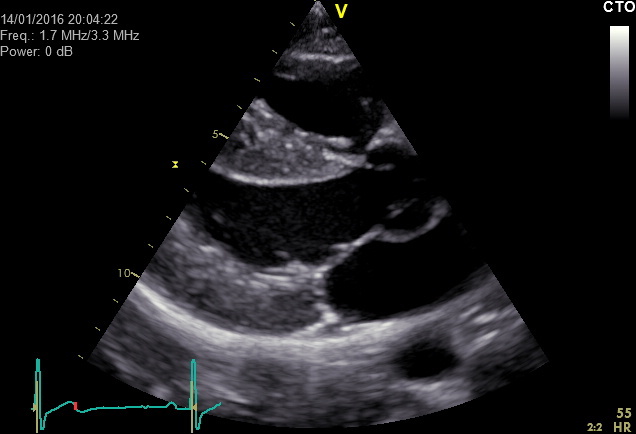 In order to acquire information about circulatory problems of the heart, coronary sonography and perfusion echocardiography using adenosine and left heart contrast dye can be performed if the informational value of the ultrasound images is limited enough to warrant the use of the ultrasound contrast dye. Coronary sonography may in isolated case enable certain sections of coronary arteries and the blood flow within them to be represented. Stenosis of the coronary arteries can itself not usually be shown. The heart is also placed under stress in this examination using medication. The drug adenosine is used during the examination to briefly expand the coronary arteries. Diseased vessels that have narrowed significantly cannot be adequately expanded, meaning that the usual rise in the blood flow rate while under the influence of adenosine (the “flow reserve” rise by around 2 to 4 times the resting value) does not occur. This enables conclusions to be drawn regarding circulatory disorders. 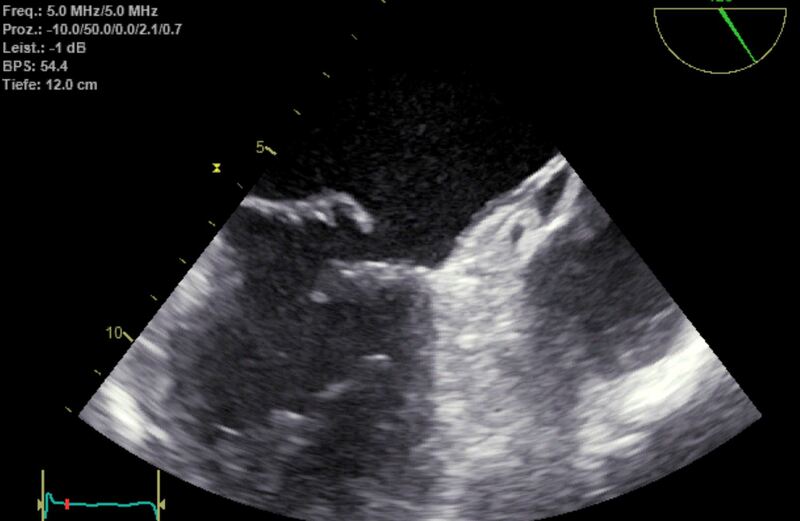 Coronary sonography can be facilitated using a left heart contrast dye. The use of a left heart contrast dye also enables the perfusion of the myocardium to be made visible. Where there is less perfusion of the myocardium or where scarring is present, there will be less contrast compared to other segments of the myocardium. Ultrasound contrast dyes are not chemically related to the contrast dyes used in x-ray diagnosis (e.g. heart catheters, computer tomography, imaging). They are used for special tasks or where the informational value of the normal ultrasound images is limited, both in transthoracic and transesophageal echocardiography. Allergic reactions may arise as a side effect to the contrast dye that is intravenously administered. Contrast dyes that are only used for the right side of the heart (right heart contrast dyes) cannot pass through the pulmonary circulation, thereby preventing them from reaching the left side of the heart. Left heart contrast dyes can pass through the lungs and provide contrast for both the right and left sides of the heart. Because the contrast dye is administered intravenously, information is provided in our practice on the use of ultrasound contrast dye and a written declaration of consent is issued (at least 24 hours before the examination). Left heart contrast dyes are used in transthoracic echocardiography in particular to improve the representation of the left ventricle, particularly with patients who are difficult to scan using ultrasound (improved diagnosis of pump function impairment). It can also be used to identify structures such as blood clots after a protracted anterior wall infarction. SonoVue® is used as a contrast dye. Left heart contrast dye can also be used for coronary sonography (see below). Tissue Doppler imaging and myocardial deformation imaging enables the function of the myocardium to be represented. Tissue Doppler imaging measures the speed at which the myocardium contracts and relaxes in each phase of the heart’s cycle. 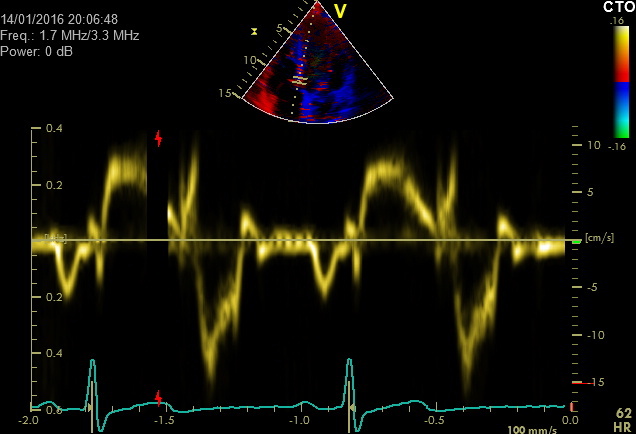 Tissue Doppler imaging is mainly used to obtain information about the heart’s function during the diastolic phase (e.g. stiffness of the left ventricle). Increased stiffness of the myocardium is an example of a possible cause of heart failure. 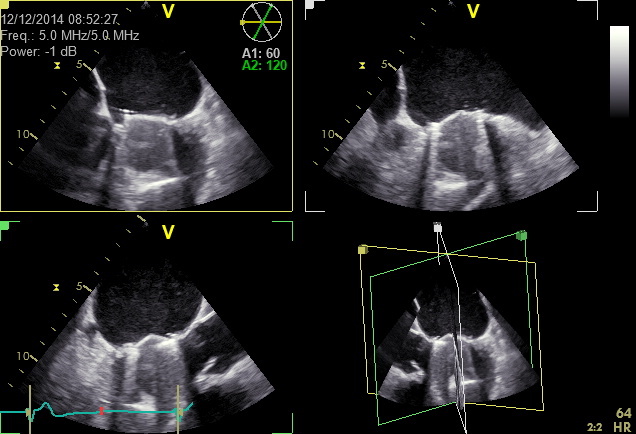 In 2D strain imaging, the two-dimensional ultrasound image is used to calculate the change in form of the myocardium as it works. This process enables information about even slight functional problems of the left ventricle to be obtained. Because the results of the test are numerical in nature, the values can be compared easily over time (e.g. during chemotherapy, which can damage the myocardium, or during myocarditis). In addition to the aforementioned ultrasound screening of the heart, we also offer what is known as duplex ultrasound scans of the carotid arteries (extracranial arteries that supply blood to the brain). This method is used to examine the arteries in the neck that supply the head with blood. For instance, it may illustrate changes caused by deposits (arteriosclerosis), narrowing (stenosis) and blockage (occlusion) of the arteries, and can be used to perform check-ups following vascular surgery and interventional procedures (e.g. stent implantation).